LiveSwitch has an initial startup fee plus a monthly usage-based licensing subscription fee, both of which cover your whole organization. LiveSwitch’s monthly licensing subscription fee is an ongoing charge that enables technical support and access to all LiveSwitch updates. 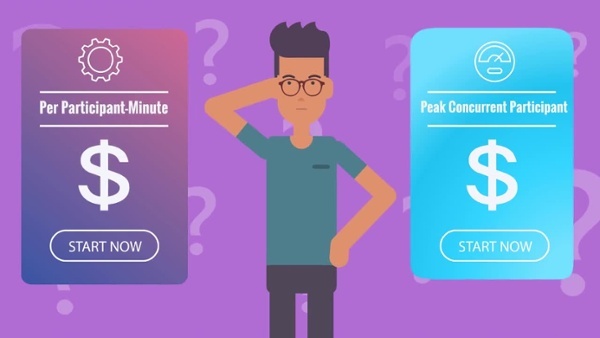 Per-minute pricing charges your account for the number of minutes each connected participant is streaming audio/video. Peak concurrency pricing charges are based on the maximum number of users that were simultaneously streaming during the month. The maximum number of concurrent users is typically much smaller than the total number of users that stream in any given month. You may change your choice of pricing option at any time at it will become effective for the following month. Not sure which one you need? Contact Us. 1. Includes initial support while customer is getting started with development. 2. Includes usage licensing, ongoing support, and product upgrades. 3. A participant is a client actively sending or receiving media in a session. 4. Concurrency is the number of simultaneously connected participants. Concurrency is measured using the high-water mark each month. 5. Measured as the length of time a client is actively sending and/or receiving media. Frozen Mountain attempts to align our pricing with customer revenue models. If the above models do not work for you, please contact us.